A struggling single mother falls under the spell of a charismatic cult leader, but her rebellious 12-year-old daughter isn’t quite so gullible. Smooth and magnetic—that description works both for the storytelling technique of British writer Wait (The View on the Way Down, 2013) and the devilishly compelling prophet, Nathaniel, who stands at the center of her new novel. Nathaniel has founded and leads the Ark, a small, sealed-off religious group operating from an isolated dwelling in northern England. Hungry for emotional intimacy, cafe waitress Stephanie is an easy mark for Nathaniel’s seduction technique, and even though her daughter, Judith, doesn’t like her mother’s new lover, soon Stephanie and Judith have joined the Ark’s community, on the moors, where women are deemed “weak and open to the devil,” wear long dresses, and never leave the compound. Judith, befriended by Moses, a child described as “marked by the devil” because of a birthmark, holds out against the slow pressure of Nathaniel’s mind games, but Stephanie puts up little resistance, eventually finding herself sharing Nathaniel’s sexual attention with other women and then impregnated. Worse will follow in the sections with biblical titles, which are sandwiched between chapters from “After” that reveal Stephanie and Nathaniel serving prison sentences and Judith lost in adult trauma. Both a morality tale and an examination of psychologies—the manipulative, the susceptible, the skeptical—the book delivers gothic events within an understated modern setting. Its special strengths are young Judith’s truculence and the translucent simplicity of Wait’s prose, which, while helping the reader glide over points of implausibility and inevitability, lends a crystalline quality to the scenes, whether humdrum, horrific or, ultimately, healing. 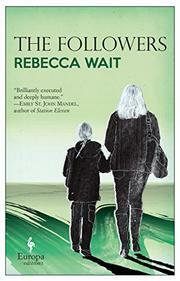 Wait handles her material with restraint and, by avoiding sensationalism, renders her grotesque story all the more resonant.